This new build apartment block contains 24 flats within its 8 storey structure. A new build block includes 1,2 and 3 bedroom apartments with two four bedroom penthouses on top. The new homes are centrally located, just minutes from the Houses of Parliament and the River Thames. 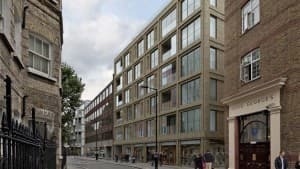 The block includes ground floor retail space, while residents enjoy the benefit of a concierge, a private gym and secure underground parking in the building’s basement. Greenwood Louvre delivered key elements for the project, including plant room screening, fire shutters and steel roller shutters as part of a fire engineering solution that ensures the building maximises open space for residents, while ensuring fire safety.